Cook, Kim and Emily Dippo (NODE). 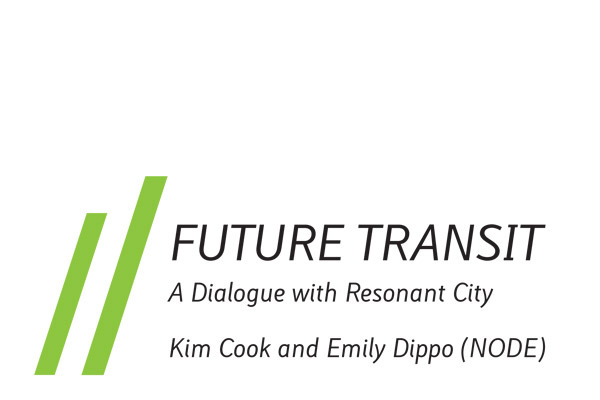 "Future Transit: A Dialogue with Resonant City," Allison Blomerth, Heatherly Born, Pam Campanaro et al. (2011) Transit/Stasis: Negotiating Movement in the City, 71 - 82. Written as a conceptual journey through time and place in the setting of the Bay Area transit system, a dialogue emerges between one collective and another. Resonant City, a small anonymous group of artists, writers, and independent researchers based in Oakland, sheds light on the complexities presented by pursuing a unified transit system for the Bay Area. Resonant City reconfigures notions of regional identity by collecting ephemera, documentation and first hand experiences from their travels along the Bay Area transit lines. The discussion between Resonant City and NODE is presented here. The two collectives reflect on the ways in which creativity, personal experiences, and encounters with fellow citizens contribute to how we navigate systems of movement and question how we affect systems of movement that navigate us. Each collective imagines future transiting for the region they call home.